Everyone has their thing. I, for one, will never buy frosting. It tastes awful and I can't handle store bought flavor. I will also only buy Heinz ketchup. It's probably petty and certainly ridiculous but even when the budget is tight, I'd rather buy half as much ketchup and wait until a sale than stare at a "western family catsup" bottle every time I open the fridge and dip into something not quite right. Note: I decorated these with Wilton's Jumbo Nonpareil sprinkles, generously donated by Auburn. I'm crazy enough that I just picked out the green ones. Good thing my husband wasn't home, he would have seriously doubted me there. Combine all ingredients in stand mixer and beat for two minutes until combined. Using a 2-tablespoon scoop, scoop into 24 paper-cup lined muffin tins. Bake for 21-24 minutes or until cupcakes spring back slightly when touched and a tooth pick inserted into the middle comes out clean. Cool on racks and frost once completely cooled. In a mixer with the whisk attachment, combine the cream cheese and butter until light and fluffy. Add in the milk, vanilla, and salt, and blend. Next, add the powdered sugar and meringue powder, cover the bowl of the mixer with a dish towel, and turn it on low until everything is combined. Then increase the speed for a minute or so until the frosting is light, fluffy, and delicious. The meringue powder will help set the frosting after it dries so it holds its shape. Those do look delicious. I admit to liking cake mix cupcakes - it's the texture. Do you have any of the Anne Byrn "Cake Mix Doctor" books? Interestingly, she is also a stickler for homemade frosting (on top of her cake mix cakes). These cupcakes look scrumptious. Merry Christmas! I'm having a giveaway on my blog, check it out if you want! I totally agree.. nothing beats Heinz and homemade frosting. That cream cheese frosting looks delicious! The last time I made it, I must have overpulsed in the food processor and it turned really liquidy. Ah! My husband is the same way! Heinz is it for him! Red velvet.. 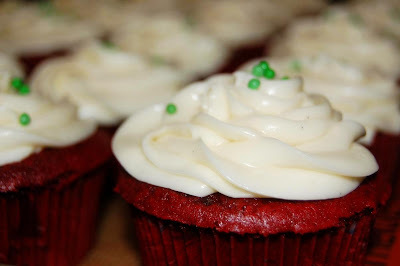 I have not had a red velvet anything is SO long... Have a Happy Christmas..
box mixes are wonderful! I have a stash of a few different kinds in my pantry. i'm definitely not a sandra lee type but box cake mixes come out just as good, if not better, than every cake i've made from scratch. plus you can still play and add flavor and moisture to the cake however you like. Here's wishing you and yours a very merry Christmas! 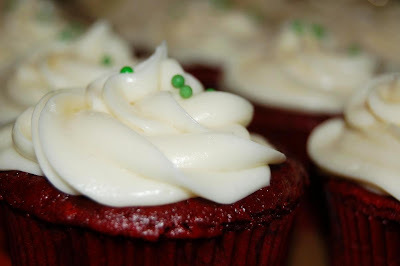 I bet that cream cheese frosting is delicious with these cupcakes! I have to admit that I am all sweetened out from the holidays but these look so so yummy!! I am already thinking a head to a Super Bowl party that we are invited to where I was asked to bring a BIG plate of baked goodies. Thanks for posting! Growing up, we always had red velvet cake (I am originally from North Carolina) and now I live in the Boston area, so, I miss it terribly. 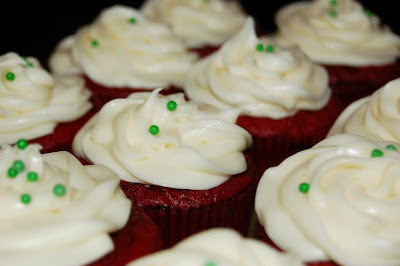 Thanks for reminding me that I needed to whip up some red velvet goodness soon! Beautiful Anne! Hope you had a Merry Christmas!! Happy New Year too! Those look amazing! I have been so dissapointed with dry cupcakes so I am excited to try these!! Anne, I came to your site (which is awesome) looking for the recipe for the red velvet cake you made us for Law Partners, and this is the closest I could find. Can you get me the other recipe? I want you to know that I make your quiche often and still love it. Miss you! TWD- Linzer Sables and a Giveaway! My Amazon Affilliate Link- when you shop here, it helps fund my kitchen adventures! Affiliate links used. All rights reserved, text & photos copyright of AnneStrawberry.